With an El Niño still in effect in the first half of the year, 2016 claimed the record for second highest number of billion-dollar natural disasters. This included 15 weather and climate disasters causing a total of $46 billion in damages. Four of these were inland flooding events not associated with named tropical storms, which doubled the previous record. The coastal Pacific Northwest was wetter than average for the year, as were Arkansas, Louisiana, Texas and the Upper Midwest. The Northeast and the Southeast were generally dry, with the exception of coastal portions of the Carolinas and Virginia, which received significant rains associated with the remnants of tropical systems Hermine and Matthew. 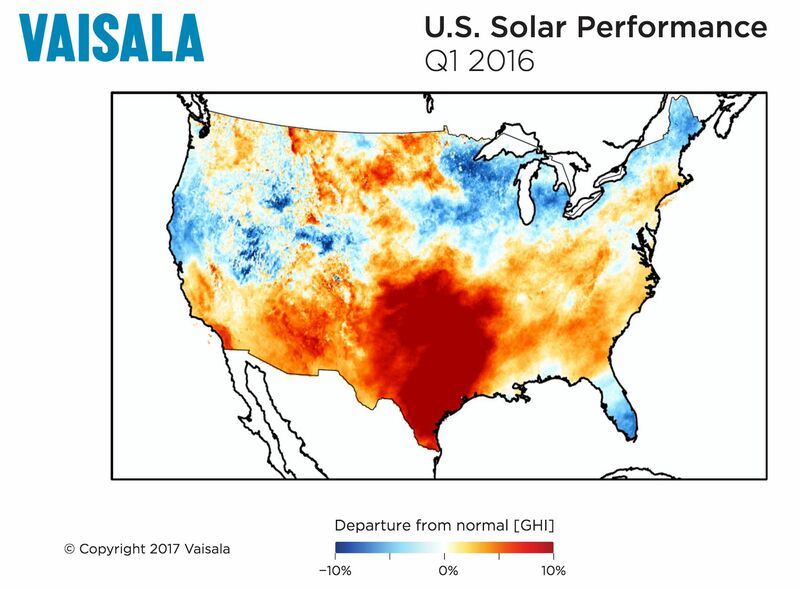 Weather and climate disasters like those in 2016 are having an effect on the solar industry. GCube’s recent Cell, Interrupted report finds that “weather-related losses are one of the most common causes of solar PV insurance claims worldwide, accounting for just under half of all utility-scale PV claims in North America and over a quarter throughout the rest of the world.” The biggest culprits were apparently floods, tornadoes and hailstorms, but other factors came into play as well, including lightning storms, component theft (copper wire, etc. ), and electrical surges, failure and interruptions. The most recent set of maps evaluate 2016 as a whole and break down each quarter. A key example of weather-related impacts came from the Solana Generating Station, a 280-megawatt concentrated solar plant near Gila Bend, Arizona. The facility was knocked out for a few days in late July by a microburst, a brief but intense period of heavy precipitation commonly associated with strong winds, and did not generate power at its normal rate for months afterward. The plant's third-quarter results for this year were approximately 25 percent lower than the third quarter in 2016. 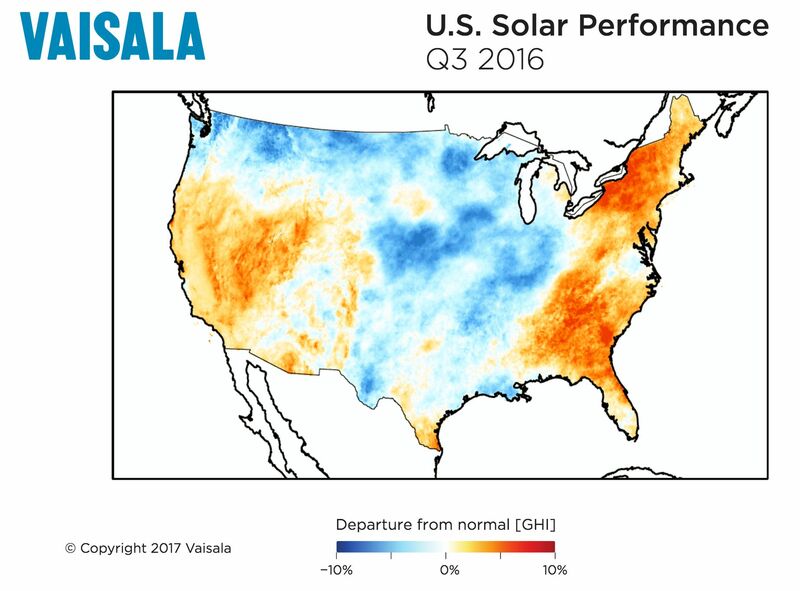 El Niño-related cloudy weather may have contributed to lower-than-expected Q1 and Q2 generation, but bad weather definitely caused the latest problem at Solana, as U.S. Securities and Exchange Commission filings show. 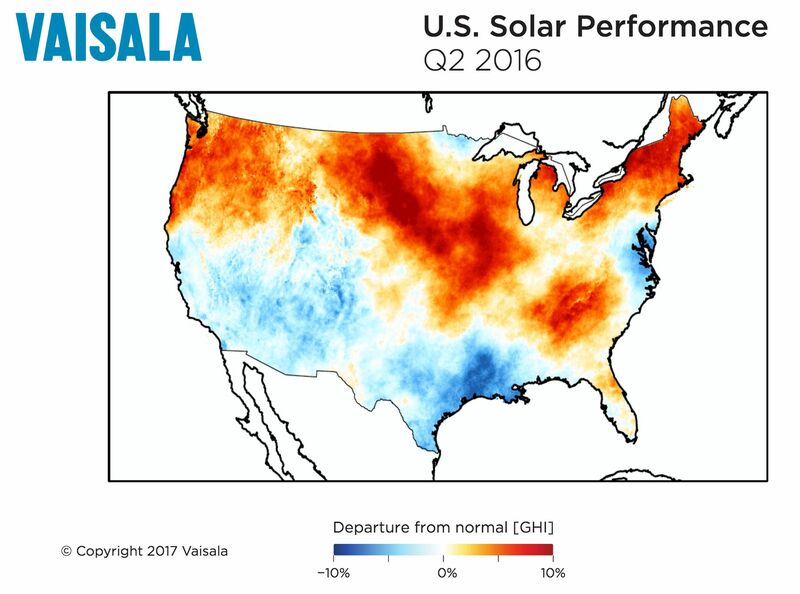 And, as Vaisala recently noted with the Californian wildfires in Q3, extreme-weather-related conditions and their aftermath can pose a very real threat to solar energy assets and revenue streams. For such events, weather modeling is accurate up to a point. But it can be almost impossible to account for the increasing unpredictability in weather events brought about by climate change, which adds a unique set of challenges. 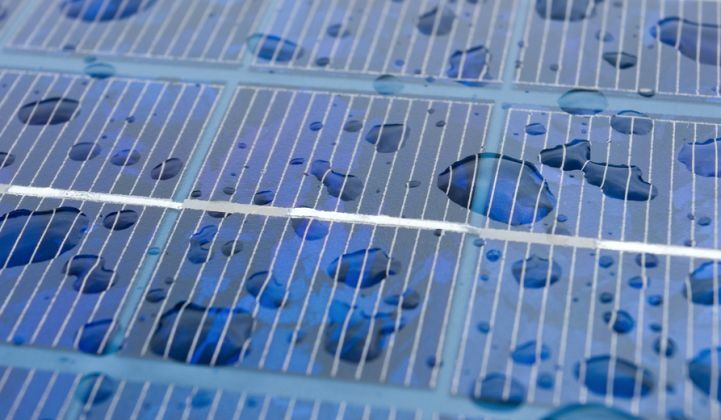 However, understanding the impacts of weather as best as possible on solar projects both in the past and future is critical for maintaining high-performing solar assets. Winter was warmer and drier than average for the contiguous U.S. The strong El Niño present in the Equatorial Pacific interacted with other climate patterns to influence U.S. weather conditions during winter through February. Drought conditions improved across parts of the Northwest and Northeast, but worsened in parts of the Southern Plains and Southwest. From January through March, the precipitation total was 6.92 inches, which was 0.04 inch below average. Above-average winter precipitation was observed across the Northwest, Central Plains, Midwest and along the East Coast. 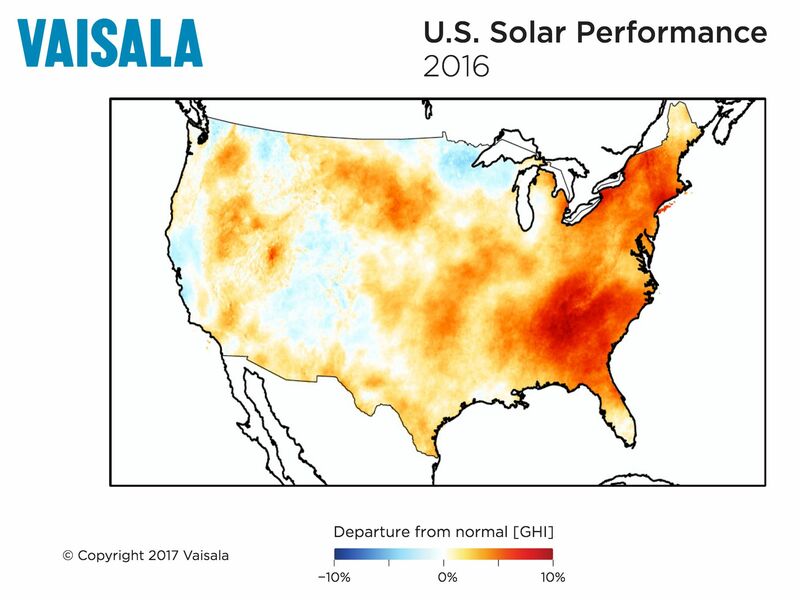 Last year featured a warm, wet spring across the contiguous U.S. Above-average precipitation fell across much of the region between the Mississippi River and the Pacific Coast, particularly in Nebraska, Wyoming, Louisiana and Texas. Dryness prevailed in the Northeast, where New York and Connecticut observed much lower than average spring precipitation. A high number of flooding events impacted Texas throughout the spring, most notably, several intense hailstorms in densely populated cities and the June 17 Houston flood. Record flooding devastated parts of southern West Virginia, while wildfires raged across the drought-stricken West. The warm and dry conditions across the West created ideal wildfire conditions with several large fires impacting the region. The Erskine fire charred nearly 48,000 acres in Southern California. In the third quarter of 2016, record rainfall across western Kentucky caused widespread flooding. 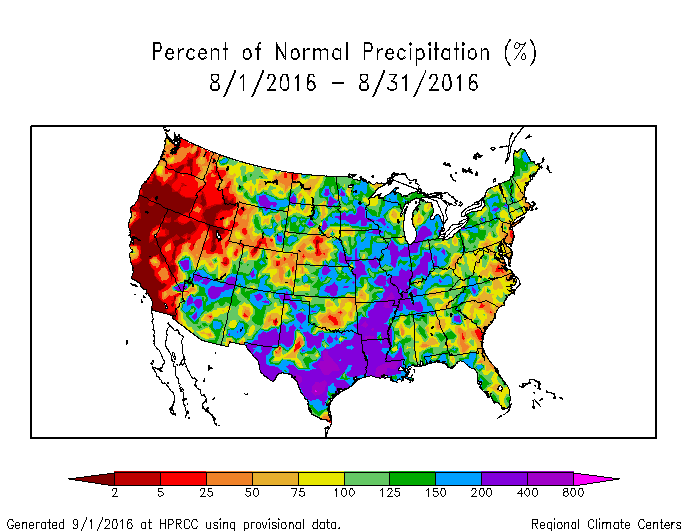 Above-normal precipitation was also prevalent across the Northwest, Northern and Central Plains, and the Midwest. Illinois, Kentucky, Minnesota, Missouri and North Dakota each had July precipitation totals that were well above average. Through the end of September, there were 12 weather and climate-related disaster events with losses exceeding $1 billion each across the U.S. These included four flooding events (doubling the previous annual record) and eight severe storms. Much of the West was drier than normal, and the dry weather was a factor in the development of numerous large wildfires across the region throughout the month. However, above-normal monsoon rainfall helped minimize the occurrence of wildfires in the Southwest. Rain from slow-moving cold fronts and tropical systems also made for a cloudier and wetter-than-normal month from the Southern Plains to Great Lakes. Precipitation during autumn was near average nationally, but with wet extremes in the Northwest and dry extremes in the Central Rockies, Gulf Coast region, and interior Southeast. While near-record dryness plagued the South and Southwest, wetter-than-normal conditions prevailed through December across the Intermountain West, Northern Plains, and parts of the Ohio Valley. The wet weather was good news for drought-stricken areas of the country, which experienced one of the more significant five-week reductions of drought coverage on record at the end of November. 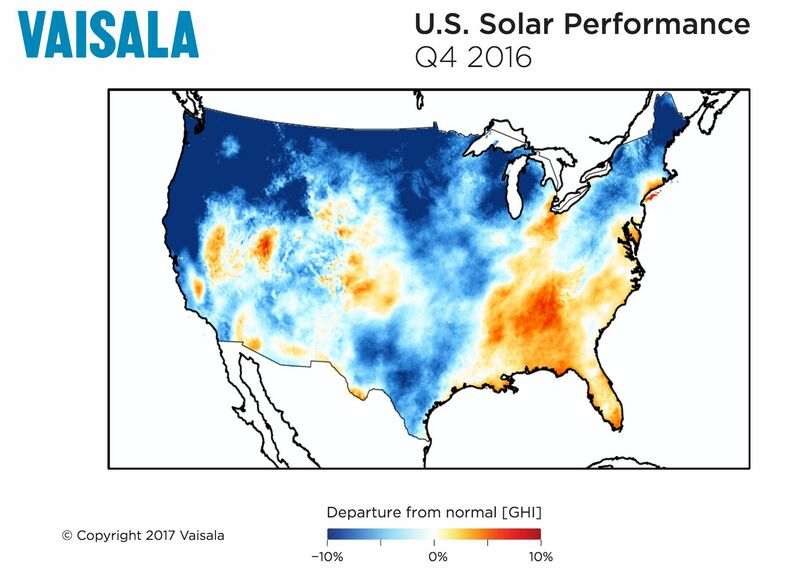 However, the accompanying cloud cover made for a lower-than-normal solar resource quarter.